Korryn Haines had a triple whammy of life events in 2014 – her father was diagnosed with terminal cancer, she was made redundant from her long-term manager role, and she found out she was pregnant. A chance connection through a networking group with an old boss informed Haines her skill set was being wasted doing temporary admin work. The old boss asked Haines to come into her business as a contractor implementing processes for her current team. It was this one act of belief in her skills that set Haines on a path to create her own business as a virtual assistant. 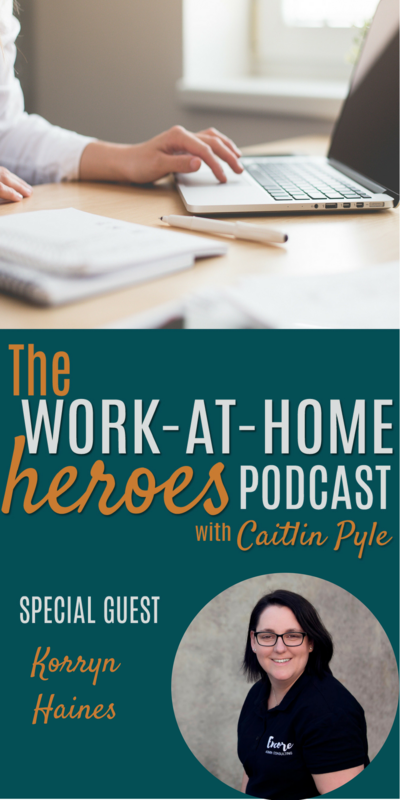 Read the transcript of the Work-At-Home Heroes podcast Episode 30 here. Visit Korryn’s website to see the kind of work she does and the services she provides! Are you interested in a career in proofreading? Visit Proofread Anywhere for more information. Need help with organization? Korryn has a free worksheet to help you with that! Have a question for Korryn? Contact her through her website or Facebook page! She would love to hear from you and answer any questions you may have. Make sure to join the Work-At-Home Heroes Facebook group! We’d love to know what you think. Got a question for Korryn about this episode? Head over to the Work-At-Home Heroes Facebook page and ask on this dedicated thread! Help us reach more people and share the Work-At-Home Heroes stories. Share this conversation on Twitter, Facebook, or Pinterest. Love us? Subscribe on Apple Podcasts or Stitcher and leave a review! Caitlin reads each and every review, and this small action really helps us out! Next Heal your work life, build your business! From makeup artist to lifecoach and course platform creator in a new country and new market! Love listening to Korryn and her journey! She's obviously going to do big things with her biz! © 2019 Caitlin Pyle. All rights reserved.